Since early February volatility has returned to the stock market. Many people are shocked. They shouldn’t be, because this sort of volatility is actually normal. Far more normal in fact than the steady markets we saw in 2017. This sort of volatility however reminds us of why a patient buy and hold approach is the recommended by the doyen of investing, Warren Buffett. Why using a stop-loss produces a poor investment strategy. Several people have asked us why we refuse to use stop-loss orders. Many inexperienced investors consider stop-loss orders to a quick fix in preventing a portfolio meltdown. In essence they are right, but stop loss orders come with a lot of costs that hut performance in ways people don’t seem to recognize until they’ve tried to use them in practice. Here’s how things proceed when you use stop loss in the real world. 1. The big question is where do you set a stop-loss level? Do you set it at say only 3-5% below current levels or further down say 15% below current levels. 2. If you set it close, say 3% then there is a good chance you’ll hit that level with normal stock price variation. So what happens after you hit a stop loss? Do you wait to see if the stock starts to rise and you buy back? What happens if you choose to wait and the stock rises back to its previous level? You’ve just locked in a loss. What happens if the stop-loss sells your shares and the price bounces back, in the SAME trading day so you don’t have a chance to buy back in. That sort of price movement happens a lot. 3. If you set it further away, say 10-15%. You haven’t really protected your portfolio and you are selling low. Selling at a time when you probably should be considering to buy, rather than sell. Remember the goal is to buy low, sell high. Not the other way around. 4. Let’s say you buy back after the stop-loss order hits, thinking it’s normal volatility. But then the stock decides to fall again. Do you set yet another stop-loss, and where do you set it? Take another 5% loss? And so on. You can see how some investors end up falling into the never ending conversation about trading strategy and forget the biggest challenge is picking the right company stock. One that will grow for the future. Your strategy : Pick something great, and then just hold. Warren Buffett and his mentor Benjamin Graham were fond of using the metaphor that the market as a bi-polar person. Sometimes manic and over-excited and happy to pay big money for shares not worth that much. And then sometimes depressed, willing to sell shares for far less than they are worth. This metaphor is a pretty apt description for a lot of the silly headlines you’ll see at extreme times. The dot-com boom and financial crisis were examples of each end of the spectrum. Be greedy when others are fearful in other words. This week we saw a lot of fear, so what does that tell you? So rather than worrying about your trading tactics, it’s better to go back to basics about your investment strategy. The better strategy is to buy something wonderful, a company with a great big competitive advantage that is growing, well run and profitable at a good price. Then simply just hold and forget about the headlines. 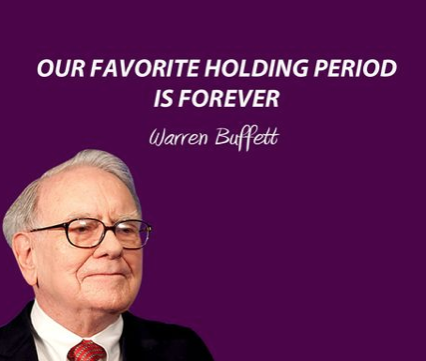 Warren Buffett’s preferred hold time is “forever”. That doesn’t mean you stop paying attention. Something a lot of people don’t understand is that you should be reading and following your existing holdings. Not as a fan boy sense. But with a critical eye trying to discern if the company is failing, changing or management has started doing something stupid. So if you are paying attention and a good company is now selling at a great price, you know you should buy some more. There were some good prices going for some great companies this week and worth buying. But only those who ignore the temporary screaming headlines were able to do this. But for those with existing holdings, sometimes doing nothing is the hardest thing of all. Since graduation Mr Owen Caterer has worked with the Queensland Premier's Department in Trade Facilitation and then as a financial adviser in Shanghai from 2005 until 2010. He then rose to Senior Adviser, then Business Development manager and then to Chief Investment Officer responsible for portfolios to a value of US$280 million across Asia. Following that Mr Caterer left to found his own firm with a partner in the financial advisory and wealth management area. This focused on developing China and Asia's first fee-based financial advisory (rather than commission-based). This has grown to now have 8 staff and and managing almost US$35 million for clients throughout Asia. This business success was recognized as a finalist in the 2013 ACBA in the Start Up Enterprises category and are one of a small number of foreign managed firms to have a full asset management license in China. Owen has also been active in the community volunteering for the Australian Chamber of Commerce in Shanghai and acting as the Vice-Chair of the Small Business Working Group (2012-2014) and as the Co-Deputy Chair of the Financial Services since 2013 until the present. They have continued to grow their business and havenow been selected as a small group of companies who are platinum members of the Australian chamber of commerce. The achievement they are most proud of is their efforts to reform the financial planning industry in China and push it away from a hard-sales commission driven model to a more ethical management fee and long term customer service model. Owen has a Graduate Diploma of Applied Finance from the Securities Institute of Australia of which he was a member as a Fellow of Finance for many years and also has an undergraduate degree from Griffith University in International Business. Owen's interests are tennis, running and his wife and two children. He speaks fluent Chinese, first arriving in China in 1997.